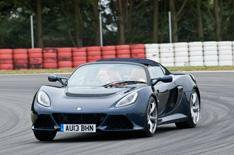 2013 Lotus Exige S Roadster review | What Car? Yes, it has a removable roof, but the new Lotus Exige S Roadster is no boulevard sun-seeker. This rear-wheel-drive sports car with its mid-mounted, supercharged 3.5 V6 is just as intent on delivering driving nirvana as its hard-top equivalent. The roof is a manual, cloth affair borrowed from the Elise, but beyond that the changes over the Exige S coupe are few. The suspension has been revised, top speed is cut to 145mph and weight is actually down by 10kg to a very reasonable 1166kg. What's the 2013 Lotus Exige S Roadster like to drive? Noisy, grippy, fast, and just generally awesome. Key to the Exige's seemingly psychic handling is a system that alters its electronic aids, throttle response and exhaust noise. In default mode, the electronic aids are all fully engaged, but the Exige Roadster still feels like a properly keyed-in sports car. The heavy steering responds quickly without feeling over sensitive, and there's a level of communication that's rare in modern cars. You're always aware of what's going on between tyre and Tarmac, although the downside is the substantial kickback you get through the steering as the wheels track over bumps and ruts. 'Sport' will be most enthusiastic drivers' mode of choice. This setting brings sharper throttle responses and a naughtier exhaust note. It also allows the rear wheels to slide a little before the stability control system cuts in. However, the system still intervenes early enough to prevent you from getting into trouble, and ultimately makes the Exige an easy and invigorating thing to drive in a committed fashion. In fact, enter a corner too fast and the Exige S will lose grip at the front wheels first, so making direction changes or lifting off the throttle through fast corners is generally fun rather than frightening. Turn everything off and you have a thrilling track day car that has monstrous grip levels and an overload of communication through the controls. It’s delirious fun. Perhaps most remarkable is that, despite the brilliant handling, the Exige S rides impressively well. It's firm and you can feel how rigid the car is over bigger bumps, but eroded Tarmac and small cracks and creases are dealt with remarkably well. The optional firmer set-up that's available as part of the Race Pack is an unnecessary addition – the standard car is perfectly capable on track and is better on road. The supercharged V6 motor sounds great and delivers its potent stream of power predictably, making the Exige as fast as plenty of things costing twice as much money. and while there are gearboxes out there with slicker shifts, the standard six-speed manual has a satisfyingly short throw. What's the 2013 Lotus Exige S Roadster like inside? Sparse. You can spec the Exige Roadster up to include all sorts of rather un-Lotus-like comforts including heated leather seats, but as standard you don’t even get air-con (an eye-watering £1100 option), just some cloth-covered bucket seats, and a rather aftermarket-looking stereo system. It's also quite noisy – even with the roof on. Still, if it's refinement and comfort you're after, you probably won't be looking for a Lotus of any kind. Even tall drivers will be able to get comfortable because there's plenty of legroom, and the pedals are positioned perfectly. In fact, the Exige S Roadster is surprisingly comfortable, despite the limited seat adjustment and fixed steering wheel. There's also a boot big enough to stow the roof once you've rolled it up and removed the poles it sits on. If you like the Exige S, the Roadster is the one to go for. It carries no premium over the coupe, so you pay the same £53,850 starting price, and revised suspension makes it the better all-rounder. It's not perfect, and it is very expensive. You could get a Porsche Boxster S and a substantial amount of change for the base price of the Exige S Roadster, and even though the Porsche is slower, it's a much more sensible choice for most people – particularly those who rate comfort and general usability as equal priorities with entertainment. However, if you want something that's equally as at home on a circuit as it is on a B-road, and that always feels like an event regardless of how mundane the trip, the Exige S Roadster delivers on every count.